The U.S. government has developed a ship that can fly at the speed of light, and a four person crew has been selected for the first test mission. Commander Scott Reed is from Canada, and Major James Harrow can't get over the fact that a Canadian was chosen to serve above him. But he's determined to be a hero and receive the adoration of the masses when they return home. Rounding out the crew are Captain Deedee Polson and Captain John Heintz. As they lift off and head out on their mission, their excitement level is high ~ as are their hopes for a very successful mission. But when they enter a thick fog over the Bermuda Triangle, the mission takes a very different course. Suddenly, the crew finds themselves in a land that seems like home, but it is? They soon encounter a tribe of people living a very primitive life, and a pack of wolves that don't really act like the wolves back home. Where are they and what do they have to do to get home? 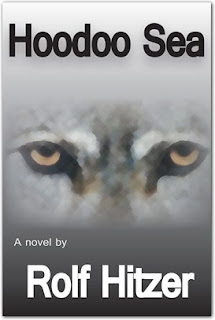 Hoodoo Sea by Rolf Hitzer pulled me along from beginning to end. The short, concise chapters drive the story along at a fast pace. There are many twists and turns as we try to figure out where they are and what is going to happen next. It definitely held my interest throughout. I would describe this novel as sci-fi with some horror thrown in during the second half of the book. It also has a bit of a religious tone as some of the characters pray for their survival throughout their adventure. There's a whole feeling of good vs. evil as well. The storyline is engaging, but the dialog wasn't great ~ I was particularly annoyed with the fact that every other sentence spoken by Scott had "eh?" at the end, and every other sentence spoken by James had "man" at the end. I thought these were good ways to show who the characters are, but they could have been used once every 50 pages and still made the point. The other issue I had was the ending. I loved the book until the last page. And then I was very disappointed. I can't say much more without giving it away, but I'm sure it's a personal thing ~ some people will love the ending and some won't. Personally, I thought there were several other options that would have made it more interesting for me. For more information about Hoodoo Sea, visit Rolf Hitzer's website. Read an excerpt of Hoodoo Sea. This review was written based on a copy of Hoodoo Sea that I received from Pump Up Your Book in exchange for an honest review.